So you’ve started thinking about maybe selling your condo and buying an HDB, but there are so many questions on your mind – “Am I eligible to own an HDB?”, “Do I need to pay extra fees?”, “How much time does all this take?”, “What should I do first?!”. The number of things to consider is honestly overwhelming. To make your life a little easier, we’ve broken down and answered all the questions you might have. Can I buy an HDB after selling private property? When can I buy an HDB? What happens to my existing condo loan? What happens to my CPF? Do I need to pay Seller’s Stamp Duty (SSD)? How much loan can I get for my HDB purchase? Can I get a grant for buying an HDB? Do I need to pay Buyer’s Stamp Duty (BSD)? Do I need to pay Additional Buyer’s Stamp Duty (ABSD)? Which HDB can I afford? Should I sell my condo first or buy an HDB first? Singapore’s regulations for selling and buying are some of the most confusing, and you’re taking the right step to research first. If you need further help and advice, find Singapore’s best property agents experienced in downgrading, on Propseller. An accomplished agent will be key for you to get through this with minimal stress and maximum results. When downgrading from a condo to an HDB, the first thing to check is if you’re even eligible to own an HDB and if you are, when you can buy it. a. Can I buy an HDB after selling private property? This entirely depends on your marital status and your citizenship. If you’re single, you need to be at least 35 years old and a Singapore Citizen (SC) to buy a 2 room BTO flat or a bigger resale flat. If you’re married, at least one of the two of you between you and your spouse needs to be an SC or both of you need to be Singapore Permanent Residents (SPR). If one of you is a foreigner (FR), the other must be an SC. See the table below for an overview of your eligibility to buy a new HDB flat vs a resale HDB flat. There are several other eligibility criteria such as income ceiling, ethnicity, ownership status of other private or foreign properties and so on when it comes to buying an HDB, which you can read about on HDB’s site. If you need someone to analyse your specific case, you can ask us for free (or you can use the chat icon on the bottom right of your screen). b. When can I buy an HDB? If you’re eligible to buy both a new HDB flat and a resale flat, which one should you go for and when can you buy it? At this point, you need to decide if you want to wait a few years and get a new BTO flat or if you want something sooner and get a resale flat. The second most important thing you need to do before making any decisions about downgrading from a condo to an HDB is to plan your finances. a. What happens to my existing condo loan? When you sell your condo, you have to pay off the loan that you took to purchase it. There are two things you need to take into account when it comes to your loan: the notice period and the lock-in period. Typically, you need to give your bank 3 months notice that you will be paying your loan off early. If you provide less than 3 months notice, they may charge you a fee that is anywhere between $3,000 to a percentage (%) of your outstanding loan, for the shortfall in the notice period. However, this varies from bank to bank. This is usually the first few years (1-5 years) of your loan during which the bank would give you specific interest rates (which could be flat, discounted or something else), but also would not allow you to pay it off early or switch banks. If you are still in your lock-in period for your loan, you may incur some prepayment penalties from your bank, which is typically 1.5% of the outstanding amount. If you are paying it off after your lock-in period, you do not have to pay any penalties. Note that the numbers and terms can vary bank to bank, so please check these in the Letter of Offer of your loan. b. What happens to my CPF? Every Singaporean wants to know what happens to their CPF, during each such transaction. Let’s demystify this below. Many condo sellers overestimate the cash proceeds they will get from their condo sale. 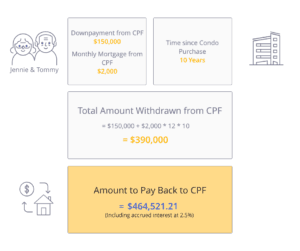 When your condo sale is executed, you have to “return” the CPF amount that you withdrew to make your condo purchase back to your CPF Account, with interest. However, it’s still your money and you can reuse it to purchase your HDB. The interest rates vary based on the amount in your account and your age. You can log in to my CPF Online Services to view your accrued interest (under “My Statement”). Let’s take the case of Jennie and Tommy, a married Singaporean couple, throughout this article. When Jennie (45 years old) and Tommy (50 years old) purchased their condo 10 years ago, they took money from CPF for the downpayment as well as for monthly mortgage payments. They had a minimum of $20,000 each still left in their accounts. 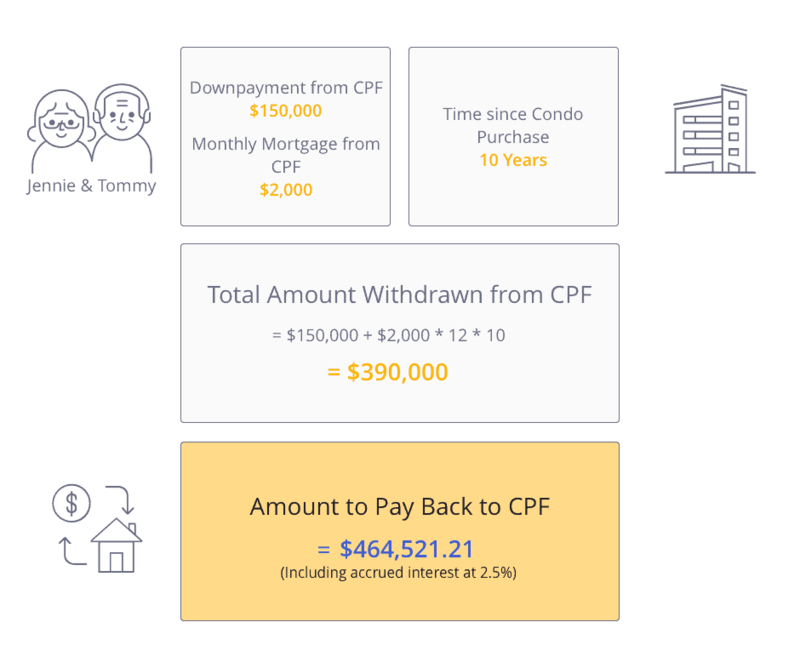 Image 1: Calculation for how much CPF Jennie and Tommy need to return to their CPF accounts after the sale of their condo. Hence, Jennie and Tommy will have to put almost $470,000 from the proceeds of their condo sale back into their CPF accounts, which they can use for purchasing their HDB or for retirement. How much you can withdraw from your CPF Ordinary Account to buy your HDB depends on the remaining lease of your resale HDB and on how much you’ve already withdrawn from it in the past. In summary, the longer the remaining lease left on the HDB you want to buy, the more you can withdraw from your CPF for it. c. Do I need to pay Seller’s Stamp Duty (SSD)? Whether or not you have to pay any Seller’s Stamp Duty (SSD) when selling your condo depends on when you purchased your property and for how long you have held it. If you have held your private property for at least 4 years, you do not have to pay any SSD. SSD is calculated on the actual price or the market value of the condo, whichever is higher. d. How much loan can I get for my HDB purchase? If you sell your condo first before buying the HDB, you would have 0 properties in your name at the time of buying, so you can get a higher loan amount. If you buy first, you would already have 1 property (i.e. your condo that you haven’t sold yet), so the HDB would be your 2nd property at the time of buying. Banks will give you a higher loan amount if you own 0 properties compared to if you already own 1 property. Bank loan LTV limits were updated on July 6, 2018. The above table assumes you do not own any additional properties. If you own more properties, check the rates here. 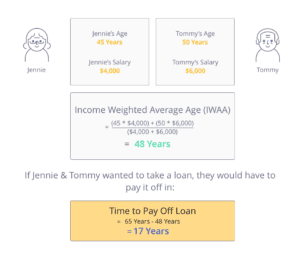 How does my age impact my loan? Sellers can sometimes forget that their age matters a lot for their next purchase. The monthly mortgage for the property they want to buy next will be calculated based on it. You will be surprised at how high your mortgage can get when you’re older. Since the “borrower” in your case is actually a couple, i.e. you and your spouse, your combined age is taken based on your income. It is called your Income Weighted Average Age (IWAA). 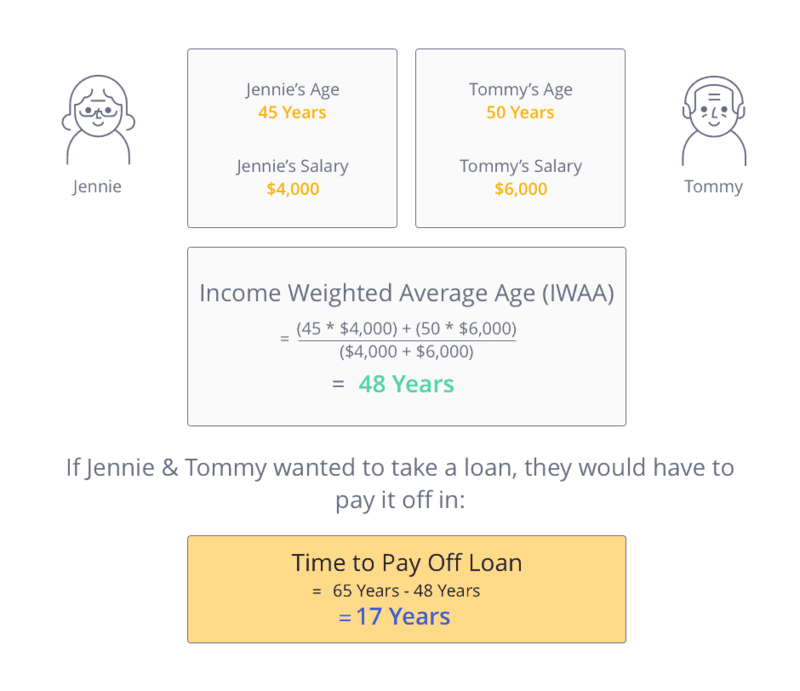 Image 2: Calculation for Jennie and Tommy’s Income Weighted Average Age (IWAA) and the time available to pay off their loan. This is a difference of nearly $800 per month, which could have a huge impact on their cash flow. This calculation is hence crucial to complete, before making decisions on what you can afford to buy. e. Can I get a grant for buying an HDB? HDB offers many grants for making a purchase – for singles, orphans, first-time HDB applicants, families who want to live close to their parents or children and many others. They all have specific eligibility criteria which you can check on HDB’s site: for a resale HDB flat, for a new HDB flat. Note that you can get a maximum of 2 such grants in a lifetime. f. Do I need to pay Buyer’s Stamp Duty (BSD)? Yes, you will have to pay a Buyer’s Stamp Duty (BSD) when you buy your HDB, which will be based on the purchase price or market value of the HDB you end up buying (whichever is higher). The rates above were updated on February 20, 2018. Jennie & Tommy want to know how much the BSD will cost them if they buy an HDB worth say $500,000. Image 3: Calculation for how much BSD Jennie and Tommy would have to pay if they buy an HDB worth $500k. Jennie and Tommy need to pay $9,600 to purchase an HDB worth $500,000. g. Do I need to pay Additional Buyer’s Stamp Duty (ABSD)? Whether or not you have to pay an Additional Buyer’s Stamp Duty (ABSD) depends on whether you buy your HDB first or sell your condo first. If you buy first, then yes, if you sell first, then no. This is because if you buy first, it would be considered the “second property” under your name. If you sell your condo first, you have no other properties under your name, so the HDB would be considered the “first property” under your name. The rates above were updated on July 6, 2018. The rates indicated here apply to you if you do not own any other additional properties. If you do, do check the ABSD rate for your purchase on IRAS. You can get a refund on your ABSD if you sell your condo within 6 months of making your HDB purchase. However, if you take longer than 6 months to sell, you cannot get your ABSD refunded. Image 4: Calculation for how much ABSD Jennie and Tommy would have to pay if they buy an HDB worth $500k first before selling their condo. Since $60,000 is more than they can afford, they would consider selling first to avoid having to pay it. Now that you have all these numbers ahead of you, what do you do with it? Your next step is to check what you can afford and make decisions on what you need. 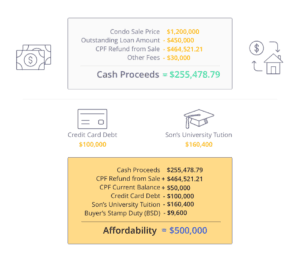 The amount of cash and CPF you have available will be the determining factors on whether you are able to buy first or not. a. Which HDB can I afford? You first have to calculate the amount of money you have for the purchase, and also determine if you need extra cash for renovation, other investments, paying off debts etc. 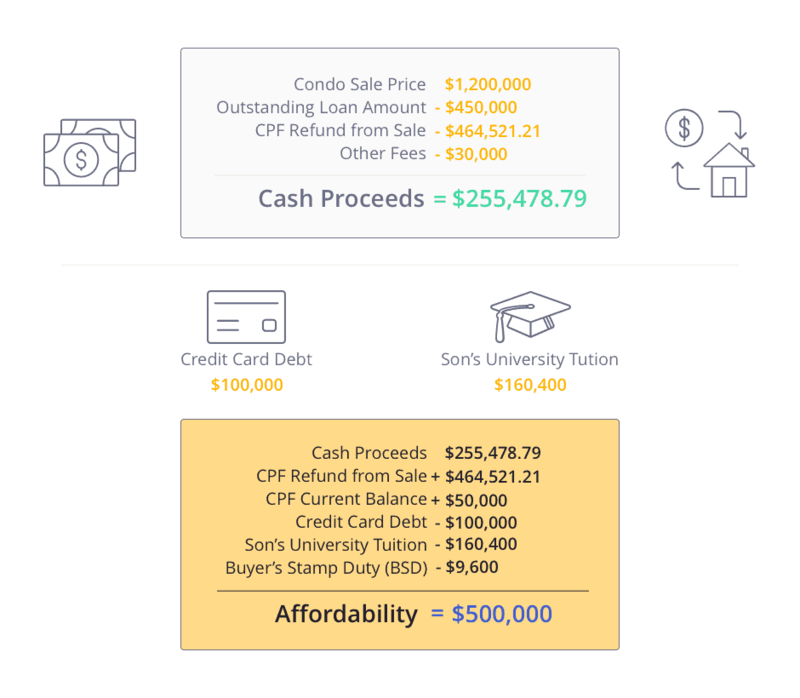 Image 5: Calculation of affordability for Jennie and Tommy, based on their condo valuation price, cash balance, CPF balance and expenses. Note: These are average prices and can vary based on the location, the condition of the individual unit etc. Based on their budget of $500,000, they can get a 4 or 5 Room HDB with at least 60 years left on the lease. b. Should I sell my condo first or buy an HDB first? Depending on whether your eventual decision is to buy the HDB first or sell the condo first, the timeline of events may vary. However, the steps are the same and the most important ones are listed below. Your property agent’s skill is crucial to the success of your property sale and purchase. Given the number of frequently changing regulations there are to stay on top of, and the tight timelines you have to work with while downgrading from a condo to an HDB, you want someone who knows what they’re doing. Note that if you don’t already have one, you can find an experienced agent on Propseller. And everything that comes after. See the timeline infographic below to see the individual steps to be taken during the sale and how long each step takes. Note: If you need cash earlier because your purchase went through faster than your sale, you can get a bridging loan. See the timeline infographic below to see the individual steps to be taken during the purchase and how long each step takes. Image 6: Timeline and steps to sell your condo and buy a resale HDB. Note that these timelines are based on current market practice and regulations, and are subject to change case by case. In conclusion, before you make any decisions on which home to buy, first check your eligibility, then calculate your finances, then check what you can afford and finally create an action plan. Downgrading from a condo to an HDB is a complex process with many regulations, but it can be simplified if you follow the steps above and have great professional help from agents and lawyers. Have any questions about downgrading your condo? Ask us in the comments or on the chat icon on the bottom right of your screen! Don’t have an agent yet? Find agents experienced in downgrading from a condo to an HDB on Propseller, to start your journey. Disclaimer: All information and materials contained in these pages including the terms, conditions and descriptions are subject to change. In addition, we do not make any representations or warranties that the information we provide is reliable, accurate or complete or that your access to that information will be uninterrupted, timely or secure. Whilst every effort has been made to ensure the accuracy of information on the Site, we do not warrant the accuracy, adequacy or completeness and expressly disclaim liability for completeness, accuracy, timeliness, reliability, suitability or availability with respect to the Site or the information and materials contained on the Site for any purpose.